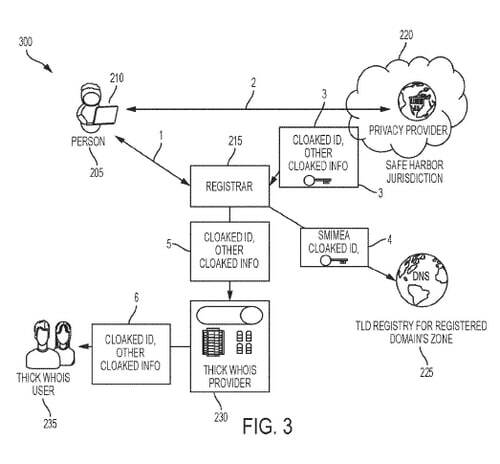 Verisign patent application covers handling European Union compliance. A figure from Verisign’s patent application that describes a way to offer privacy-compliant Whois. The European Union’s General Data Protection Regulation (GDPR) will affect how domain name Whois services are delivered starting next year (podcast). In some cases, including .com, the burden as of now will fall on domain name registrars. In the so-called “thin Whois” model that .com uses, registrant information is stored by the domain name registrar (e.g. GoDaddy). With new top level domains, the registrant information is stored by the registry (e.g. Donuts) in what is called a “thick Whois” system. .Com is due to transition from a thin Whois system to a thick Whois system in 2018. This means the burden will shift from registrars to Verisign (NASDAQ:VRSN). This transition may well be delayed as the domain community figures out how to handle GDPR, but it’s clear that Verisign is hard at work figuring this out for itself. The company filed a patent application in May 2016 for Systems and Methods for Preserving Privacy of a Registrant in a Domain Name System. The application was published by the U.S. Patent and Trademark Office today. The application describes a system of meeting EU privacy requirements including storing the customer information in legally-permitted locations and only displaying information that should be publicly available. It lists Verisign engineer Andrew Fregly as inventor. You can review the patent application here (pdf).